ERNST & FRIENDS is an international distributor in the watch and jewelry industry with decades of branch experience. From benches, polishing and cleaning machines over watch movements and batteries to carat scales and engraving machines: ERNST & FRIENDS provides a wide range of high-end and innovative equipment and tools for watch and jewelry producers, service centers and wholesalers. The companys strength is the combination of high quality, speed and a personal consulting service. 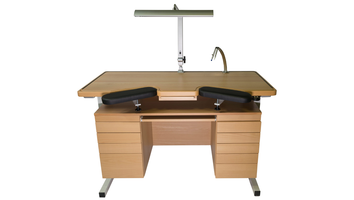 Ergonomic watchmaker bench, "ERGOLIFTER XXL" with electrical height adjustment. Powder coated with silvergrey metal frame. Large solid beech wood top plate 150 x 65 x 4 cm with collecting grooves and convex stopper for spare parts etc. Water proof testing under vacuum and pressure, using the principle of the deformation measurement. Range is from -0.7 up to 10bar. The newest machine of the MAGIC series is being used with MagicArt 5 and can easily mark and engrave all different kind of jewellery and can even cut nameplate out of plates. Customer call it: Plug and play! The smartest & fastest diamond tester in the world that is designed for smart testing of natural earth-mined coloress diamond (D-J) type Ia, Ib from lab created or synthetic type IIa, IIb / CVD / HPHT mounted and loose colorless diamonds.